PRINCE2 (PRojects IN Controlled Environments) is the internationally recognised best practice approach to project management used globally by many organisations in all industry sectors. PRINCE2 is the de-facto standard for project management in the UK and is practiced worldwide. Being able to apply the necessary project management principles and techniques is essential for the development of a high performing project management professional. Whilst the PRINCE2 Practitioner qualification is a pivotal part of this programme, participants will truly understand and be able to apply what they learn throughout the programme to their own projects and they will share ideas with colleagues and have the confidence to challenge and influence their ways of working. Ultimately, creating better project managers is the primary aim of this programme. As one of the largest accredited training organisations for PRINCE2 training globally, and with industry-leading pass rates, you are in safe hands with us. Why choose a Living Learning Programme? Our unique and innovative Living Learning Programmes (LLP) support a structured career development path for all your project professionals. It will allow them to experience progressive and immersive learning as part of a collaborative community of practice, to make a distinct and tangible improvement in their day-to-day performance and your overall delivery capability. 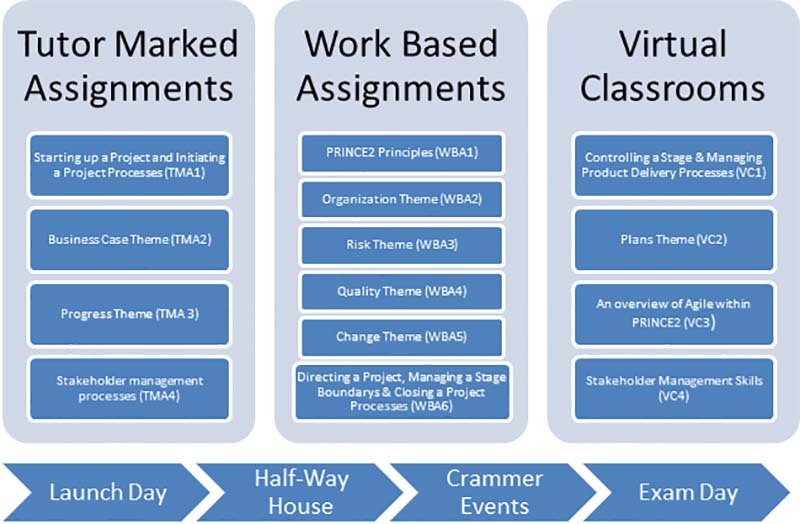 It follows the 70:20:10 model of learning, blending a selected programme of self-study, virtual classroom (VC) sessions, tutor marked assignments (TMA) and work based assignments (WBA), so that project professionals will engage with their peers and their organisation in a way they have never done before. Within this LLP, we take participants beyond the prescriptive methodology of PRINCE2, by introducing both stakeholder management and agile principles, which we believe are essential skills required for a successful project manager who is able to meet and exceed both employer and customer expectations. Who is this Living Learning Programme aimed at? Existing or aspiring project managers wishing to achieve a broader level of project management understanding and applications to enable them to participate in projects from individual assignments through to large complex projects. Whilst pre-existing project management experience is not essential, it certainly is beneficial and strongly recommended in order to gain the most from this investment. Through a carefully selected programme combining self-study, virtual classrooms (VC), tutor marked assignments (TMA) and work based assignments (WBA), project professionals will engage with their peers and the organisation in a way they have never done before. The programme will last typically for a 12 week duration, starting with a Launch Event followed by a mix of VC's, WBA's & TMA's that are carefully scheduled to ensure a good balance between the 'day-job' and meeting the demands of this LLP. In addition, at the mid-way point, a 'Half-Way House' event is attended by all and finally, before the examination is scheduled a 'Crammer' event is attended to ensure everyone is given the best possible chance of success with the PRINCE2 Practitioner examination. All of the aspects of the programme are designed to promote reflection and improvement and to encourage participants to find opportunities to apply the learning in their workplace. This LLP is intended for project managers and aspiring project managers. Participants should ideally have experience of working in a project environment and have a basic understanding of project management issues. Should participants not currently hold the PRINCE2 Foundation qualification, then QA can offer a route to this certification via either a two-day classroom event or a more flexible option of eLearning. Details of our PRINCE2 foundation eLearning can be found here. Participants can then take their exam in a QA centre, on a public exam day, or on a dedicated exam day for multiple participants, or online via ProctorU. Increase your team's awareness of their roles and responsibilities within the life cycle of their own projects.